This may be one of the number one questions we get in regards to engagement sessions. And it's a valid question, because it DOES matter. First, it's important to note your photographer's style. Is it dark and moody? Light and airy? The reason this is important, is because your clothing choice will either take away from this style or add to it.. you want to add to it! Keep in mind that I am doing my best to write this from a non-biased perspective. I only want to give you a few guidelines on what looks great on camera! Let's start off with color! For our style, we get a lot more couples who show up with neutral colors and shades of blue. This truly compliments our work because we either shoot with film or digital made to look like film, and the neutral and blue tones are only enhanced with this! Another thing we love about neutrals, is that the attention is on you as a couple, and not so much on what you're wearing. Now, I will say a fun pop of color doesn't hurt either! I would shy away from neon colors or overly bight colors that may cast a neon orange or pink light back into your face when the sun hits it. It's also a headache to edit later! Another color to be mindful of is green. A lot of our sessions are shot with a green background. Meaning, trees, grass...you get the picture. Depending on the shade of green, it can easily blend into the background. If you are planning your session downtown or with more of a neutral background such as concrete, stones, buildings.. then you may want to lean more towards color than neutrals. I will keep this brief. Larger patterns are okay, but smaller stripes, gingham, plaid, etc. are usually not a good idea. You can see a few examples below of patterns that photograph well. This may be the most important thing to consider (In my opinion), and that is FIT. Make sure if you are wearing a short dress, and you do not like your legs in pictures, that might not be the best option. Opt for a maxi dress for a little more coverage if you are self conscious in that area. You should also make sure what you wear accentuates the smallest part of you. So ladies, if you are pear shaped like me, an A-line dress may be your best bet. If you are thinner, you may want to choose a straighter more fitted option that creates a silhouette. 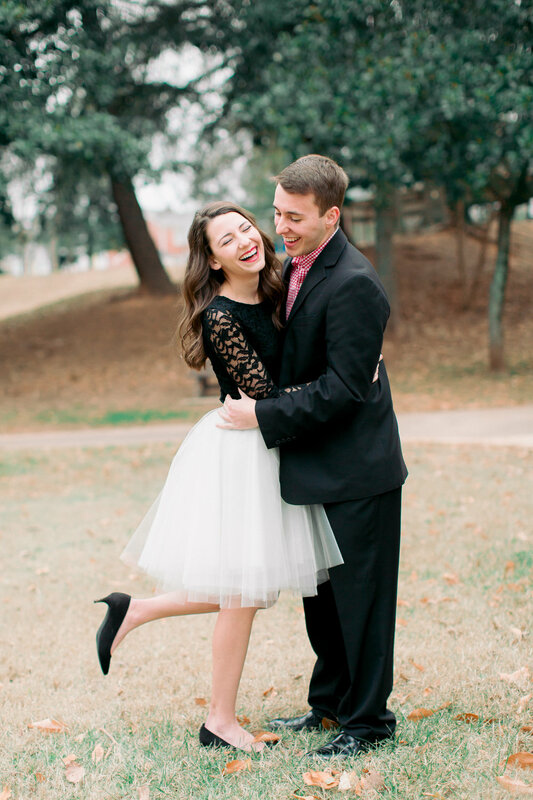 To wrap things up, we encourage all of our couples to dress how they feel comfortable! I never want you to look back at your photos and think, "That doesn't even look like me". Dress in something that makes you feel beautiful (and handsome guys) as well as confident! If you don't plan on doing bridal portraits, this is a good time for a makeup trial run. Most of our brides get their hair and makeup done professionally for their engagement session, and it does make a difference! Try to stay away from fake tanners, and don't schedule your session right after a tropical vacation.. there may be some bad tan lines that show with your outfit choice. If you do tan, make sure to give your skin a few days before the session so you don't look orange or a fake tan in your pictures. Guys, if you're going to get a professional shave and haircut, make sure to do it at least a few days before the session. Your skin will have time to breathe and if any reaction occurs, it will have time to heal. Bring an extra pair of shoes if you plan on wearing heels. Ladies, don't color your hair right before a shoot, make sure if you do color your hair to wait at least a week before your session so if there is any color left behind on the forehead, neck, etc. it has time to come off. 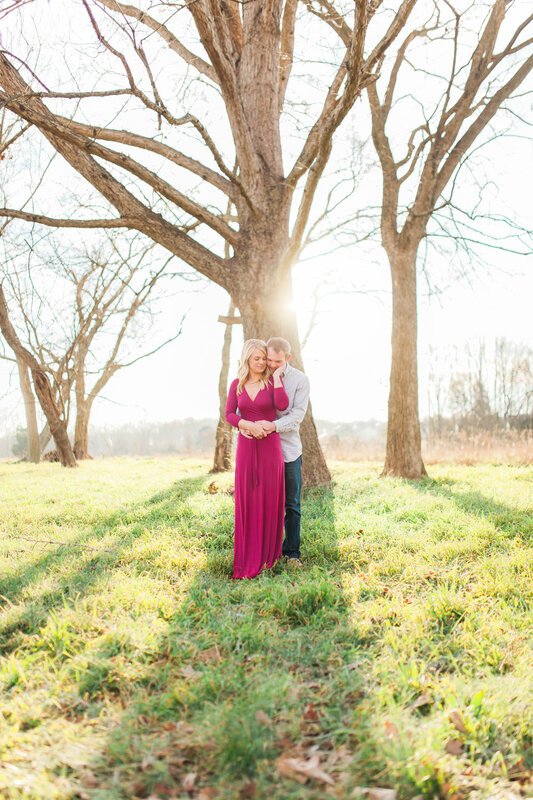 Want to win a FREE engagement session with us?! Fill out the information below to enter our contest! Winner will be chosen September 1, 2018!